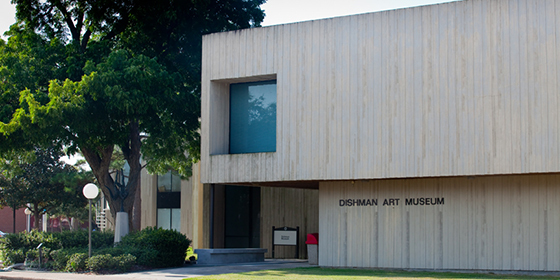 The Dishman Art Museum is open Monday through Friday, from 10 a.m. to 5 p.m., and often during weekends for special museum-sponsored events. 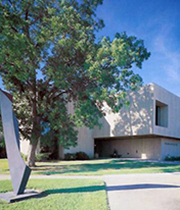 The museum is located at the northwestern corner of the Lamar University campus. The physical address is 1030 East Lavaca Street, Beaumont, Texas 77705. For general directions to the university, including campus map, visitor parking information, and an interactive Google Map, please visit the university's Driving Directions page. For specific directions to the Dishman Art Museum, see below. Dedicated parking is available outside the University gate at the Lavaca Street entrance, parking area C-5. Parking is also available in the Lamar University Visitor’s parking lot located off MLK Drive, parking area E-2. For our visitors with special needs, please call the museum upon arrival and we will provide entrance to the gated parking area directly in front of the museum. Please look for reserved signage at driving entrances. Lavaca Street entrance parking is available without charge or a permit after noon on Fridays and at all times on weekends. Buses may unload across the street in the LIT parking lot; parking for buses is limited. Periodically, other options closer to the Museum may be available; please ask about bus parking when you book your tour. Take I-10 East to Beaumont. Exit onto Highway 69 south, this is the Lamar University exit. From Highway 69, take the Martin Luther King exit, you will want to be in the left lane of the access road. At the light, turn left going under the highway. After the third set of lights, take the right hand exit onto the access road, on the access road stay in the left hand lane. Go straight at the first all way stop sign, at the second one turn left onto East Lavaca. Stay in the left hand lane and go straight at the next all way stop sign. Look for the trees in the median the parking lot entrance for the Dishman Art Museum will be on your left just before the trees. Coming into Beaumont from Orange and points east on I-10, take the Martin Luther King exit. Go straight through the first set of lights then turn left onto Martin Luther King going back under the interstate. You will go through several intersections with red lights. Once you have passed the intersection with Washington Street, take the exit labeled Lamar University/Virginia. At the all way stop, veer right, and immediately move into the left hand lane. The entrance to the parking lot is on the left right before the trees in the median. Please be careful in using GPS navigation to plot a route to the Dishman as currently road construction has necessitated some detours to main routes.